Did You Know: 5 Unexpected Pacific Northwest Tree Facts | Mr. Tree, Inc.
Forests are a defining feature for large areas of the Pacific Northwest. Coniferous temperate rainforests in the western Cascade and coastal mountain ranges are appreciated for aesthetic value and abundant natural resources. The Pacific Northwest is known for such spectacular trees as the Sequoia and some of the most abundant fruit trees in the country. The trees of the Pacific Northwest have many unique features that make for some fun facts worth exploring. The following are a handful of some of the more unexpected facts about these plants, including benefits of trees. The regional temperate climate creates ideal soil conditions and properties that hold secrets to why these trees grow so big. Soil acts as a ‘black box’ in forest ecosystems because the vital processes are hidden underground. Soil fertility, or the ability of soil to provide plants with sufficient nutrients and water, is not visually obvious, but it can be measured using scientific methods and analytical equipment. USGS scientists are examining this black box to provide important information for balancing human needs and sustaining forests. The following examples highlight completed and ongoing research. Precipitation and its effects on soil moisture shape forests across the Pacific Northwest, from the dense rainforests on the coast to the semi-arid woodlands of inland areas. Climate change will likely bring warming temperatures across the region, intensifying summer drought and moisture stress, which can limit tree growth. Climate predictions also call for wetter winters overall, with increased rain and declining snowpack. The USGS is currently studying how forests cope with the direct effects of changing rainfall and the indirect effects resulting from higher temperatures. Overall, the work seeks to understand how climate change will alter the amount of carbon stored in forests, and how this connects local and regional forests to rising levels of atmospheric carbon dioxide across the globe. Pacific madrone is native to the coastal ranges of the Pacific Northwest, from northern California to British Columbia, where winters are wet and mild and summers are cool and dry. It tolerates occasionally chilly weather but isn’t highly frost-resistant. Pacific madrone is a versatile, relatively slow-growing tree that reaches heights of 50 to 100 feet or more in the wild, but usually tops out at only 20 to 50 feet in home gardens. You may also find it listed as bayberry or strawberry tree. Native Americans ate the rather bland, reddish-orange berries fresh. The berries also made good cider and were often dried and pounded into meal. Tea brewed from the leaves and bark was used medicinally. The tree also provided sustenance and protection for a variety of birds and other wildlife. Bees are attracted to the fragrant white flowers. Oregon’s largest tree was a Sitka Spruce Giant – a 200-foot tall behemoth that grew along the coast near Seaside. The Sitka Spruce tree fell victim to a fierce wind storm. The tree broke off at about 80 feet above ground and the top portion fell to the ground and splintered. The 17-foot diameter trunk remains, and visitors can get a sense of the massive size of the tree. Large portions of the fallen tree will be left on the ground to become a “nurse log” for a new generation of the giant. The park remains the first Oregon Heritage Tree Site. Now, the largest tree is a 329 foot-tall Douglas-fir – that’s taller than a 28-story building! It is located in Coos County’s Brummet Creek. Oregon timber harvests have been relatively stable over the last 5 years. However, this trend may not continue because of declining prices for lumber and plywood, and low timber sales from Oregon’s federal forests. Public lands are now harvesting approximately 11 percent of public forest’s potential for growing timber. Private forests are harvesting approximately 93 percent of private forest’s potential for growing timber. 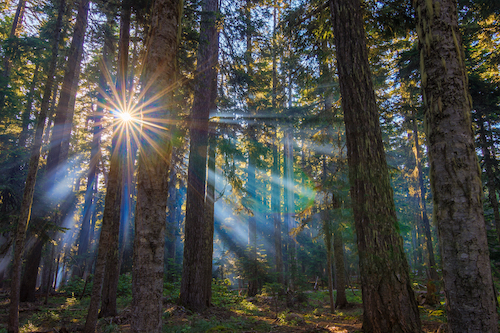 Oregon was the first state to enact comprehensive rules governing forest practices and protecting forest resources including water, fish, wildlife, soil, and air. With strong support from industry leaders, the Oregon Legislature enacted the Oregon Forest Practices Act in 1971. The Act requires reforestation, protection of water resources and wildlife habitat, limits on clearcuts and proper road construction and maintenance. Making sure these areas are sustainable is critical because of the benefits of trees. When we hear the word “rainforest”, most of us immediately think of the hot tropical jungles running along the equator like a greenbelt. However, a rainforest is simply a forest that receives a lot of rainfall, and there are areas of the world with more mild temperatures that are also home to rainforests, including North America. There are only seven temperate rainforest ecosystems around the world, and North America is home to one. The Pacific Northwest temperate rainforests, which range from northern California to British Columbia, exist in what is the world’s largest temperate rainforest ecoregion. Home to a rich diversity of species, many of which are found nowhere else in the world, it’s an incredible place to explore. And with one of the highest levels of biomass of any place on Earth, you are certain to come across something beautiful on every step of your journey across the forest floor. There is no denying the beauty of the Pacific Northwest or the benefits of trees. Local tree experts can offer even more insight and tree guidance if you want to explore further.